The Fox is back for 2019! The course direction has been reverted from 2018 to run clockwise - as it did in 2017. We've teamed up with ULTRA magazine again to bring you The Fox Ultra. 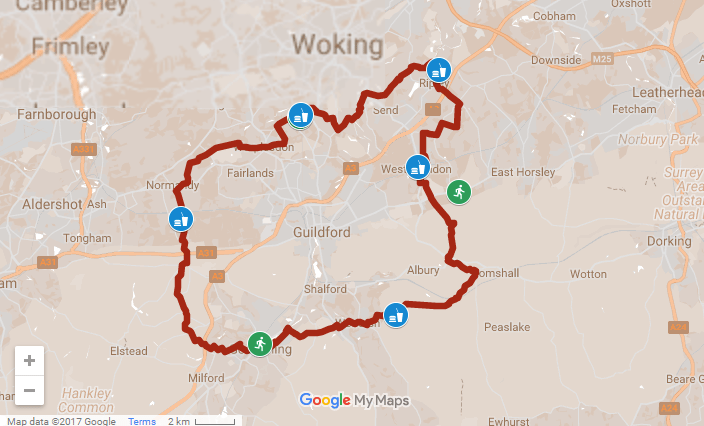 A 60km circular ultra run route around Guildford. The route will be fully marked and offer 5 aid stops along the Fox Way. This scenic circular course was devised by Richard Fox, an avid local walker who was amazed by the beautiful and varied countryside he found along the route. Keen to share his findings, Richard set about signing and publicising his "Fox Way." 60km participants register in the Godalming United Reformed Church. Collect your timing chip and race number. 42km register at Worplesdon Place Hotel at Worplesdon (GU3 3RY). 10 am time-trial starts. Relay leg 2 participants register at the Worplesdon Train Station (GU22 0RN) and await their relay leg 1 runner there. 21km register at Clandon Train Station Car Park (Clandon, Guildford GU4 7UB). 10 am time-trial starts for 21km runners. Relay leg 3 participants register at the Clandon Regis Aid Station (GU4 7TT) and await their relay leg 2 runner there. The 60km event start/finish is close to Godalming train station which has a reliable and a frequent service from London or cycle to the start and get a free bike saddle cover. 42km, 21km and relay participants are requested to avoid leaving cars at their start locations and to share lifts wherever possible. Sturdy trainers, appropriate running gear – dress for the weather, waterproof jacket, suitable water bottle, warm hat and gloves. You must carry at least 500ml of water, charged mobile phone (with the number of event control in it), a head torch, emergency numbers for The Fox event team, any additional nutrition you may require, a waterproof and first aid kit. Baggage: Bag storage is available within the Wilfrid Noyce Centre for Ultra and 1 leg relay runners. Those starting from Worplesdon train station and Hatchlands Park there will be an event vehicle at your start which will be at the Godalming finish line when you finish. There is space for one small bag each only. First Aid: Medics on the course and present at the start/finish. You will be given a contact mobile number prior to race day. If you or a fellow runner suffer an injury which requires medical attention then call and medics will be dispatched. If the injury is sever please call 999 and then inform event control. Toilets: Toilets will be available at the start/finish and along the course at feed stations. Water: Available at feed stations on course. Water, flat coke, a lot of food types including salty snacks, water melon, vegetables and dips, peanut butter dip and much more. Finish line massage from Rebecca Humphries and team. Kick-start your recovery with a 15 minute post event massage to boost recuperation, reduce muscle soreness and restore motion. £15 per 15 minutes. Some admin issues. I didn't receive the crucial email with the event details which affected my travel arrangements. My name wasn't on the list. The timing chip recorded a time which was more than 20 minutes slower than my own gps time. I did the Ultra distance. Lovely course, really enjoyed the route & even managed to enjoy the hills. Friendly people & a good atmosphere. great event first attempt at a n ultra and thoroughly enjoyed it event staff and Marshall were excellent and made it the great event that it was. Great race, good facilities at the end and a good atmosphere. As it’s a linear run transport back to your car would be a help. Last thing you want to do after a marathon is to mess around with public transport. Great event with plenty of off road and an interesting trail run. Took part in the 2018 event as it was just a short walk from my house, and loved it,. Beautiful countryside, well organised and well marshalled. Great challenge and will be doing it again. Fantastic event! My shoe fell apart and I got a massive blister but we got round, no dramas and there was a very welcome beer van at the end! I love the Fox Ultra. I did this in 2017 and then came back for 2018, which was the same route but in a different direction. This made a difference doing it in a different direction as it is a loop. The event is so well organised. There is absolutely no way you will get lost as there are signs everywhere to follow. This definitely makes it a really good Ultra to do as a first. Also the hills are a challenge especially if this is your first hilly ultra but not exhausting. The volunteers are amazing! They are just what you need at an aid station. Helpful and happy no matter what the weather conditions. The food and drink available is perfect. I love doing this race as a start to my ultra season for the year. You can train through the winter and it is normally glorious weather come April. I have recommended it to lots of people. Best of all this year I met a new ultra running buddy at The Fox Ultra and we have gone on to stay in contact and run more ultras together throughout the year. I did the ultra in 2017 but only needed a half at this time in 2018. Really enjoyed it. Would certainly recommend this race. Last year I made a comment and was really pleased to see this had been actioned. 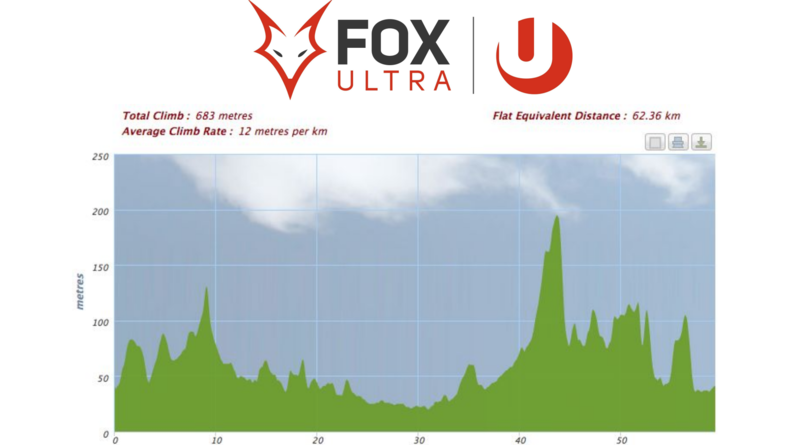 I ran the Fox ultra race and, as with all aat events, it was well organised. The registration & briefing was good, the navigation was spot on - the course was well signposted but as there is a lot of off-road it does require an element of focus to ensure you see all of them.My only complaint is that the food provided at the end is substandard. It consisted of jelly babies, a small piece of tray-bake cake and a banana. Hi Stephen - I'm glad you enjoyed your run with us. Sorry you felt the food at the end was a slight let-down. The cake was self-serve, so you could have had as big a slice as you liked, or have come back for seconds! What would you have liked to see beyond jelly sweets, cake, bananas and ice pops? Happy to take suggestions - [email protected] Thanks!